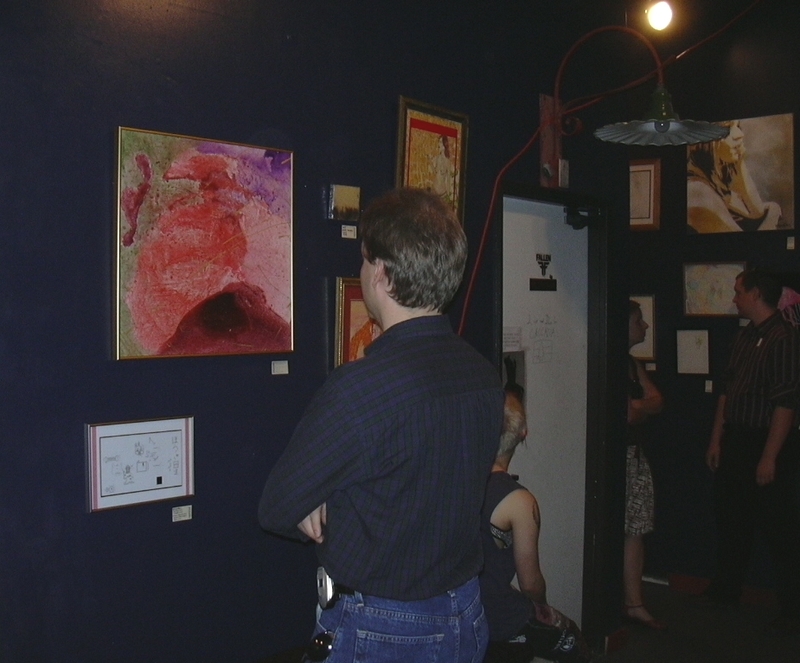 The place was crowded, so LOTS of people got to see my art (and the art of 199 other artists, but you know what I mean). This also meant that my introvert circuits kicked in fairly soon. And I felt a bit out of place. If one gathered the all attendees over 25, not wearing black and without tats or piercings, we probably wouldn't have enough to play Bridge. I did wear an improvised button of my LJ user pic, in case anyone from the damportlanders community recognized it, but nobody said anything. Maybe they didn't want to be seen associating with someone so non-alternative. So by the time J showed up, I was pretty much done. He looked about at the art, and then we waited outside for drarwenchicken and her friend L to arrive. I showed them my artwork, and they quickly decided that it was too warm to stay there. So we went over to the Everett Street Studios, where I got to tell about helping build a theater in one of the tiny studio apartments (I think it seated 15). Unfortunately, we had to deal with the dense crowds of smokers on the sidewalks there as well. I had come straight from work, so I was tired and hungry, so I left them to continue their viewing. While it wasn't as much fun as I had hoped, I can now add the Backspace Anniversary Exhibition to my artist resume! I take a great deal of satisfaction from that.